Quick and easy one-pot prep! Prepare Dinner as directed on package, using the Sensible Solutions directions and adding peas to boiling water for last 2 min. ; drain. Stir in ham and 1/4 cup cheddar cheese; cook on medium heat 1 to 2 min. or until heated through, stirring occasionally. No need to thaw the peas before adding to the boiling water. Return the water to a boil after adding the Macaroni before timing the last 2 min. of the cooking time. 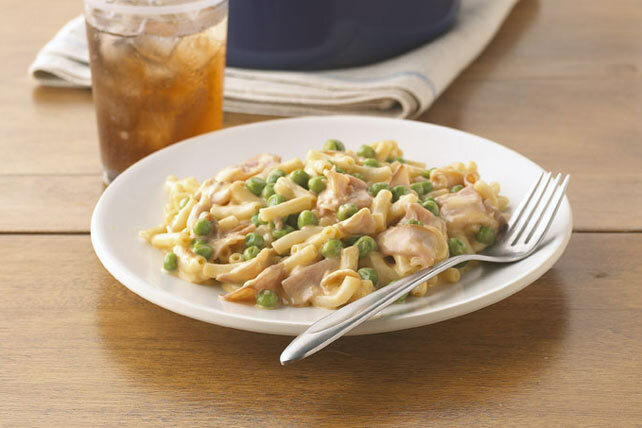 The peas in this cheesy dish add colour, flavour and a good source of vitamin A. The cheese also provides a good source of calcium.